Our Round 7 Feature Match has two players with only one loss in the tournament thus far! 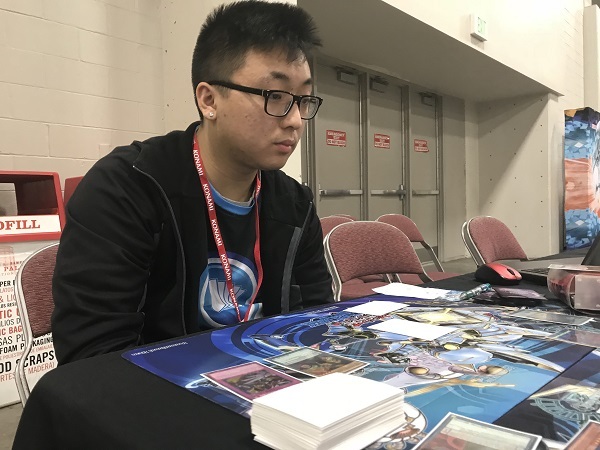 Denny Yu from Sacramento, California is here with Metalfoes True Draco – a Deck we also saw piloted to victory by UDS Champion Aaron Furman in Round 3. 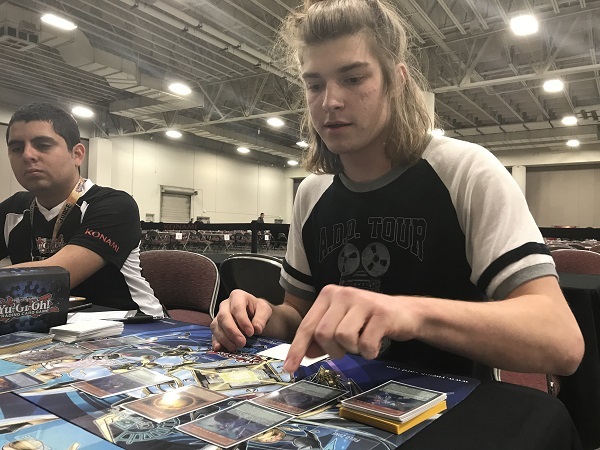 Yu is up against John Andrew Goad from North Ogden, Utah and his Pendulum Magician Deck. It’s time to Duel! Yu won the roll and elected to go first. He started with a hand of Rescue Hamster, Metalfoes Goldriver, Metalfoes Volflame, Metalfoes Steelen, and True King’s Return. Yu activated Metalfoes Volflame and Metalfoes Steelen. He used the effect of Metalfoes Volflame to destroy Metalfoes Steelen and Set Metalfoes Combination from the Deck. He then Normal Summoned Rescue Hamster, Tributing it to Special Summon 2 copies of Steelen from the Deck. He Link Summon Heavymetalfoes Electrumite and used its effect to kick Astrograph Sorcerer from his Deck to the Extra Deck. He then used Heavymetalfoes Electrumite’s other effect, destroying Volflame to add Astrograph Sorcerer to his hand, which was then Special Summoned and added another Volflame from his Deck to his hand. He then drew Rescue Rabbit from Heavymetalfoes Electrumite’s effect. He then activated Volflame and Goldriver, then Pendulum Summoned Volflame and Steelen from the Extra Deck and Rescue Rabbit from his hand. 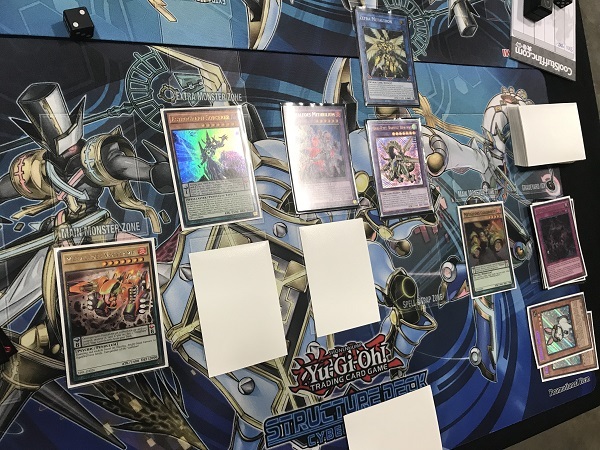 He used Astrograph Sorcerer and Volflame to Xyz Summon Odd-Eyes Absolute Dragon, then Yu used Rescue Rabbit to banish it to Special Summon 2 copies of Metalfoes Silverd from the Deck. He then used Goldriver’s Pendulum effect, destroying Volflame to Set Metalfoes Fusion from the Deck. He then used Odd-Eyes Absolute Dragon and Heavymetalfoes Electrumite to Link Summon Zefra Metaltron. Odd-Eyes Absolute Dragon’s Graveyard effect Special Summoned Odd-Eyes Vortex Dragon from the Extra Deck. Next, Metalfoes Fusion was activated, sending the 2 Silverds to the Extra Deck to Fusion Summon Fullmetalfoes Alkahest. He used the effect of Metalfoes Fusion to shuffle it back into the Deck to draw another Rescue Rabbit. He Set True King’s Return and passed. Goad activated Mythical Beast Master Cerberus to the Pendulum Zone. He used the effect to destroy it to add Mythical Beast Jackal King from his Deck to his hand. He then activated it, then destroyed it to Special Summon Mythical Beast Master Cerberus from the Extra Deck. He then activated Chronograph Sorcerer as a Pendulum Spell, but Yu Chained Odd-Eyes Vortex Dragon, shuffling back Metalfoes Silverd to negate the activation and destroy Chronograph Sorcerer, sending it to the Graveyard. He then Normal Summoned Purple Poison Magician. He used Mythical Beast Master Cerberus to attack into Fullmetalfoes Alkahest. Yu used the effect of Fullmetalfoes Alkahest to equip Goad’s Purple Poison Magician. The attack continued and Alkahest was destroyed, sending Purple Poison Magician to the Extra Deck. He activated Stargazer Magician as a Pendulum Spell, Set a card to the back row and passed. Yu Normal Summoned Rescue Rabbit, using its effect to Special Summon 2 Metalfoes Goldrivers from the Deck. He used both of them to Xyz Summon Castel, the Skyblaster Musketeer. Its effect was used to shuffle Goad’s Mythical Beast Master Cerberus back to his Deck. Next, Yu activated his Set Metalfoes Combination, then he used Goldriver’s Pendulum Effect to destroy the Combination and Set Metalfoes Fusion from the Deck. He then used Combination’s Graveyard effect to add Metalfoes Volflame from his Deck to his hand. He activated it to the Pendulum Zone, then used the effect to destroy Castel to Set Metalfoes Combination from the Deck. He then Pendulum Summoned Volflame from his Extra Deck and Astrograph Sorcerer from his hand. Next, Metalfoes Fusion was activated, sending Steelen and Volflame to the Extra Deck to Fusion Summon Metalfoes Mithrilium. He used Metalfoes Fusion’s Graveyard effect to shuffle it back into the Deck and draw a card. Next, Mithrilium used its effect, targeting Volflame and Goldriver in his Graveyard to return to Yu’s Deck and targeting Goad’s Set card to bounce back to his hand. 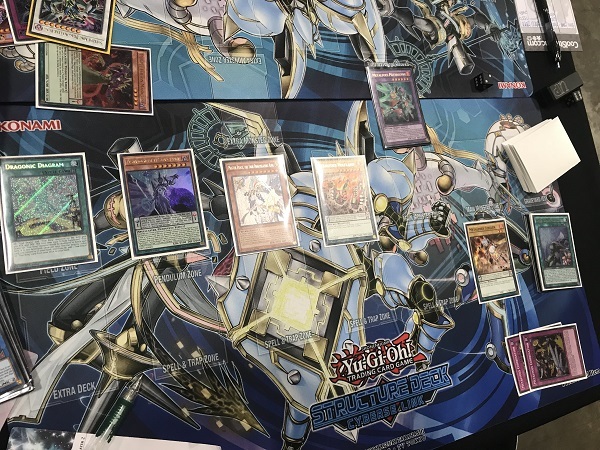 Goad Chained it – Time Pendulumgraph – and its effect targeted his own Stargazer Magician and Yu’s Odd-Eyes Vortex Dragon which Yu Chained to negate. Goad then activated Astrograph Sorcerer, Special Summoning it. Yu then activated his Set True King’s Return and used Volflame’s Pendulum effect to destroy True King’s Return and Set Metalfoes Combination from the Deck. True King’s Return’s Graveyard effect destroyed Goad’s Astrograph Sorcerer and that was enough ATK to end the first Duel! Goad elected to go first in Duel 2. He started with Dragon Shrine, sending Supreme King Dragon Darkwurm from the Deck to the Graveyard. Its effect let it come out of the Graveyard and its other effect added Supreme King Gate Zero from his Deck to his hand. Next, Chronograph Sorcerer was placed in the Pendulum Zone and its effect destroyed itself to Special Summon Timegazer Magician from the Deck. Next, Goad activated Astrograph Sorcerer from his hand, Special Summoning it and adding another Chronograph Sorcerer from his Deck to his hand. Then, Goad used Supreme King Dragon Darkwurm and Timegazer Magician to Link Summon Heavymetalfoes Electrumite. Its effect kicked another Astrograph Sorcerer from the Deck to Goad’s Extra Deck. Next, he activated Supreme King Gate Zero as a Pendulum, then he used Heavymetalfoes Electrumite’s other effect, destroying Supreme King Gate Zero and adding Astrograph Sorcerer back to his hand from the Extra Deck. Astrograph Sorcerer’s effect then let it Special Summon itself and added another Supreme King Gate Zero from his Deck to his hand, while Heavymetalfoes Electrumite’s effect let Goad draw a card. He then used both Astrograph Sorcerers to Xyz Summon Odd-Eyes Absolute Dragon and then it and Heavymetalfoes Electrumite were used to Link Summon Zefra Metaltron. Odd-Eyes Vortex Dragon came out from Odd-Eyes Absolute Dragon’s Graveyard effect. Next, Supreme King Gate Zero and Chronograph Sorcerer were placed in the Pendulum Zones. He then Pendulum Summoned Supreme King Dragon Darkwurm and Chronograph Sorcerer from the Extra Deck with Black Fang Magician from his hand. He used Black Fang Magician and Supreme King Dragon Darkwurm to Xyz Summon Evilswarm Nightmare. Goad Set one to the back and passed. Yu started with Metalfoes Goldriver, Dragonic Diagram, 2 copies of Metalfoes Combination, The Winged Dragon of Ra – Sphere Mode, and Metalfoes Steelen. He Tributed Goad’s Zefra Metaltron, Odd-Eyes Vortex Dragon and Evilswarm Nightmare to Tribute Summon The Winged Dragon of Ra – Sphere Mode to Goad’s field! He then activated Dragonic Diagram, then Set Metalfoes Combination, then activated Dragonic Diagram’s effect, destroying Metalfoes Combination to add Master Peace, the True Dracoslaying King from Deck to hand. The Graveyard effect of Metalfoes Combination let Yu add Metalfoes Volflame to his hand as well. He then placed Metalfoes Steelen and Metalfoes Volflame as Pendulum Spells. Yu used Steelen’s effect, destroying Volflame to Set Metalfoes Fusion from the Deck. He then activated Goldriver, but Goad Chained Dimensional Barrier declaring Pendulum. He Set Metalfoes Combination and passed. Goad activated Duelist Alliance, adding Pendulum Call from his Deck to his hand. He then activated it, discarding Supreme King Dragon Darkwurm, adding Harmonizing Magician and Black Fang Magician from his Deck to his hand. Goad then Normal Summoned Black Fang Magician, then used it and Chronograph Sorcerer to Link Summon Heavymetalfoes Electrumite. He used Heavymetalfoes Electrumite’s effect to kick Astrograph Sorcerer from his Deck to his Extra Deck. Heavymetalfoes Electrumite’s other effect destroyed Chronograph Sorcerer to add Astrograph Sorcerer back to his hand. (Pendulum Call only prevents cards with “Magician” in their names from being destroyed from the Pendulum Zones, so Chronograph Sorcerer’s destruction is fair game.) In a new Chain, Heavymetalfoes Electrumite’s effect to draw activated, then Astrograph Sorcerer’s effect Special Summoned itself and added another Chronograph Sorcerer from his Deck to his hand. He then activated Chronograph Sorcerer in the Pendulum Zone. He then Pendulum Summoned Black Fang Magician from his Extra Deck and Harmonizing Magician from his hand. He used Harmonizing Magician’s effect to Special Summon Purple Poison Magician from his Deck. He used Purple Poison Magician and Harmonizing Magician to Synchro Summon Ignister Prominence, the Blasting Dracoslayer! He used its effect, destroying Yu’s Steelen and spinning Yu’s face-down Metalfoes Fusion back to the Deck. Goad went into the Battle Phase and took all of the attacks, sending us to the third Duel! Yu elected to go first in Duel 3. He started with a hand of Metalfoes Volflame, Metalfoes Combination, Master Peace, the True Dracoslaying King, and 2 copies of Astrograph Sorcerer. He activated Metalfoes Volflame and Astrograph Sorcerer as Pendulum Scales, then used Volflame’s effect to destroy Astrograph Sorcerer and Set Metalfoes Combination from the Deck. He used the other Astrograph Sorcerer in his hand to Special Summon it and add another copy from Deck to hand. He then Set Metalfoes Combination from his hand, then Tributed both Traps to Tribute Summon Master Peace, the True Dracoslaying King! He used the effects of the Metalfoes Combinations to add Metalfoes Steelen and Metalfoes Goldriver to his hand. Next, he activated Steelen, using its effect to destroy Volflame and Set Metalfoes Fusion. This also let him use the third Astrograph Sorcerer to Special Summon it and add Volflame from Deck to hand. Yu then activated Goldriver and Pendulum Summoned a Volflame from the Extra Deck and one from his hand. He used Astrograph Sorcerer and Volflame to Link Summon Heavymetalfoes Electrumite. He activated the effect, but Goad Chained Ghost Ogre & Snow Rabbit to destroy Heavymetalfoes Electrumite. The effect resolved and Yu added Metalfoes Silverd from his Deck to the Extra Deck. He used Astrograph Sorcerer and Volflame to Xyz Summon Odd-Eyes Absolute Dragon. Yu used Goldriver to destroy Odd-Eyes Absolute Dragon and Set Metalfoes Combination. Odd-Eyes Absolute Dragon’s effect Special Summoned Odd-Eyes Vortex Dragon from the Extra Deck! He passed there. 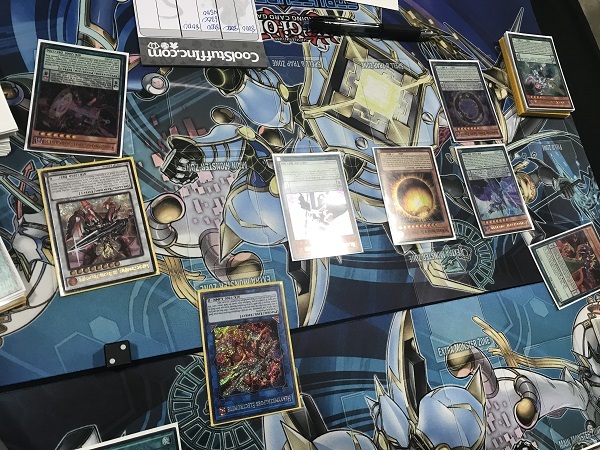 Goad went to the end of the Battle Phase and tried to activate Evenly Match from his hand but Yu negated it with Odd-Eyes Vortex Dragon’s effect. In Main Phase 2, he activated Supreme King Dragon Darkwurm as a Pendulum Spell, then used its effect to put Supreme King Gate Zero from his Deck to the vacant Pendulum Zone. He then Pendulum Summoned Harmonizing Magician and another Supreme King Dragon Darkwurm from his hand. he used the effect of Harmonizing Magician to Special Summon Purple Poison Magician from his Deck. Time was called at this point. He used Purple Poison Magician and Harmonizing Magician to Synchro Summon Supreme King Dragon Clear Wing! Its effect was activated and Yu Chained Master Peace’s effect, banishing a Metalfoes Combination from his Graveyard to destroy his own face-down Metalfoes Fusion. Master Peace and Odd-Eyes Vortex Dragon were destroyed by Supreme King Dragon Clear Wing’s effect. Yu drew Rescue Hamster for turn. He used Metalfoes Fusion’s Graveyard effect to shuffle it back into the deck to draw Dragonic Diagram. He activated Metalfoes Combination, then used Goldriver’s effect to destroy it, setting Metalfoes Fusion and adding Metalfoes Steelen from his Deck to his hand. He then activated Dragonic Diagram, destroying the spent Goldriver and adding Master Peace, the True Dracoslaying King. Yu then Normal Summoned Rescue Hamster, Tributing it to Special Summon 2 more monsters from his Deck. He then used Link Summoned Heavymetalfoes Electrumite. Yu then used Heavymetalfoes Electrumite’s effect, destroying Steelen and adding back Astrograph Sorcerer, whose effect let him add a Steelen from Deck to hand. He drew Rescue Rabbit from Heavymetalfoes Electrumite’s draw effect. He then activated Steelen and Silverd as Pendulum Spells and then Pendulum Summoned Rescue Rabbit from his hand along with Goldriver and Volflame from the Extra Deck. (He tried to use Rescue Rabbit here but was out of things to Summon.) He then flipped the Set Metalfoes Fusion, fusing Goldriver and Heavymetalfoes Electrumite to Fusion Summon Metalfoes Mithrilium. He used its effect, sending Heavymetalfoes Electrumite and Volflame back to his Deck to bounce his own Dragonic Diagram, which he replayed and used, destroying Silverd and adding True Draco Heritage from his Deck to his hand. He activated it then used the Tribute Summon effect, Tributing Rescue Rabbit and Heritage for Master Peace, the True Dracoslaying King. The Heritage’s effect destroyed the Supreme King Dragon Darkwurm in Goad’s Pendulum Zone. He attacked with all of his monsters, clearing Goad’s field and leaving him at 2450 LP. Goad drew to 2 cards in hand and had no answer to the field. he extended the handshake! Denny Yu moves on with a 6-1 record!